On Wednesday 3rd October we launched our new £B Champions programme. We were delighted to welcome a great mix of business owners, community and council representatives from around the city to a lively reception where the programme was introduced by £B Chair Ben Heald and MD Diana Finch. Community champions – volunteers working in their local neighbourhoods across Bristol to raise awareness of the Bristol Pound. Business champions – businesses leading the way in their engagement with the Bristol Pound, who are committed to helping other Bristol businesses through that engagement. Funding champions – people who want to support the Bristol Pound philanthropically, helping us develop the scheme to the point where we are able to fund ourselves through trading. Read on to find out more about the programme, and click here for more information on these three roles and to get in touch. 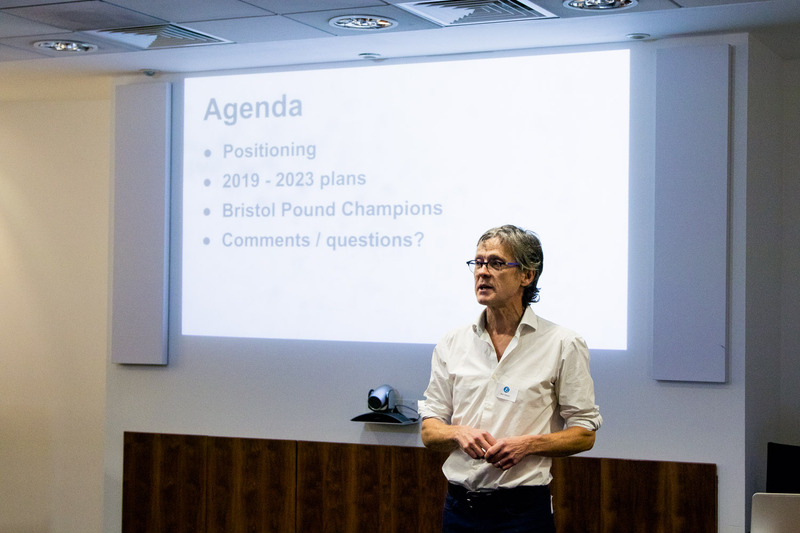 Writing in a personal capacity, Ben Heald, the Chair of Bristol Pound, blogs about the launch of Bristol Pound’s new Champions programme earlier this month. Having appointed a new MD and launched Bristol Pound’s 3rd generation notes in July, the Champions launch is a key milestone in Bristol Pound’s transition. Whilst it was never the intention, there is a perception that Bristol Pound is a niche currency for the relatively affluent. The Champions programme will change this. 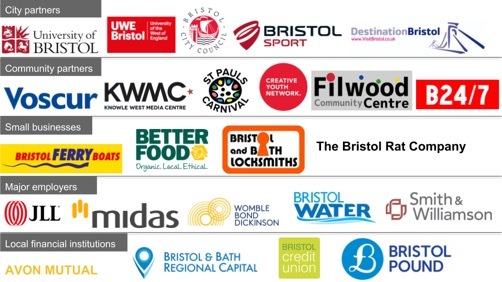 We’re reaching out to all neighbourhoods of the city via Community Champions, working with Business Champions who share our goals and, finally, appealing to Funding Champions keen to ensure we don’t lose momentum in our ambition to make Bristol more diverse, inclusive and economically resilient. We held the launch at law firm Womble Bond Dickinson, who offered us a room with a view. I’d met one of the partners, Jon Bower, at the City of Hope event in May and was impressed with his commitment to Bristol (and we’ve since discovered we’re fellow Park Runners). I started by setting out the founding principle of Bristol Pound – to retain money within Bristol rather than have it leak out to distant supply chains and shareholders. I made the point that whilst on many counts Bristol Pound had been successful in its first five years, with 650 businesses and 1500 individual members opening accounts and approximately £B1m traded in 2017, we hadn’t yet moved the needle! Hence the need to be much more ambitious in Phase II. We’d invited representatives from community organisations, the council and businesses in order to make the point about working with other city stakeholders and also connecting with a wider city agenda. I said that based on conversations with people across the city, it felt there was considerable common ground for the need to focus on measures such as inclusion, diversity, economic resilience, happiness & sustainability as much as on traditional economic measures such as monetary growth and employment. 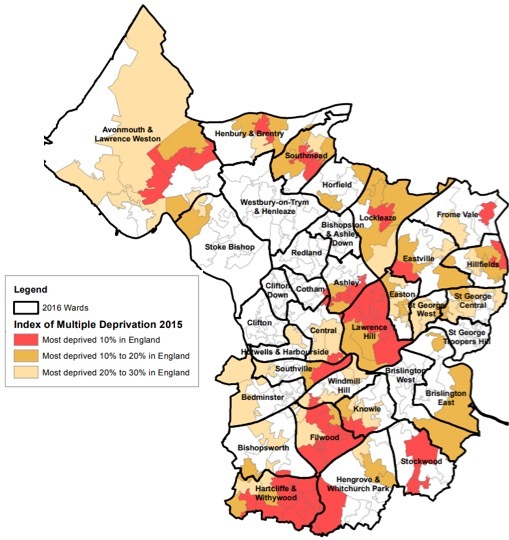 As testament to this common city agenda, I commented on the recent launch of Bristol City Funds, community news group 24/7’s Better Bristol initiative and also this week’s Economics of Happiness Conference. It’s important to stress that this conviction isn’t just because these measures are important in their own right. 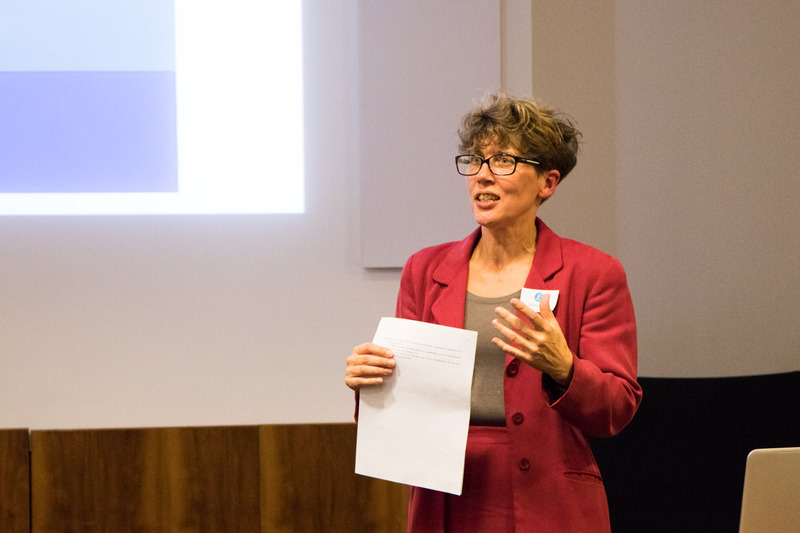 From my own perspective as chair of four Bristol organisations, when teams are more diverse and inclusive they make better decisions, staff are happier, recruitment is easier, plus customers like it – so it’s also better business. Thus, Bristol Pound sees itself as one element of the Bristol ecosystem, and in particular working closely with the local financial institutions Bristol Credit Union, Bristol & Bath Regional Capital and Avon Mutual. Next, Bristol Pound’s new MD Diana Finch reiterated that Bristol Pound couldn’t do everything itself and needed to work in partnership. She said there were many areas of the city where Bristol Pound had yet to be adopted by local businesses, and where individual members (who wanted to spend Bristol Pounds to make a difference to their local businesses) just couldn’t. Which is where the new Community Champions come in. As ambassadors for Bristol Pound, engaging with local businesses and their local community, they’ll be building local connections and relationships. 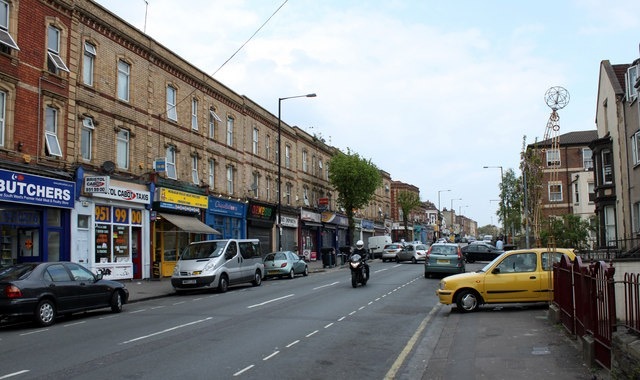 Working with local community organisations, we aim to train and support 50 Community Champions over the next five years, with each one focused on a small hyper-local area (such as Stapleton Road below). Our business members have the most to gain from Bristol Pound – after all the whole scheme has been developed to support them. Our Business Champions will promote Bristol Pound to their staff and business network, and in return, we’ll promote them. Diana gave Alec French Architects as an example. Director Nigel Dyke spoke at one of our recent business breakfasts about how they reviewed all their supplier relationships and wherever possible, not only ensured they were using local suppliers, but went a stage further, by asking them to adopt the Bristol Pound and accept payment in Bristol Pounds. We closed with some questions and comments from the audience, and there will be plenty of follow up conversations. If you’re interested in getting involved as a Bristol Pound Champion, there are further details on our Get Involved page. Ben Heald became Chair of Bristol Pound in September 2016. He also chairs St George’s Bristol as well as two local businesses, which he founded Edo & Sift.